We own a well-equipped manufacturing unit built in an area of 8000 sq.ft. CNC Machines help us in meeting the demanding applications of customers. 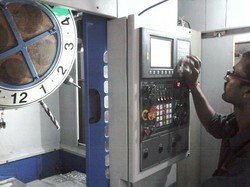 Apart from CNC, we also have standard lathe and drilling machines. Our Test bench facilitates 100% testing of each valves/actuators that is built in our factory. We have segregated our plan in various sections like Stores, Inspection, Machining, Assembly, QC, Despatch unit and so on. All these sections are ably managed and handled by our team of technocrats and other support workers. They all stringently vigil these process to ensure continuous and error free production. We deal in pneumatic equipments and valves that are very important for their application areas as the efficiency and performance of the process depends on these products. More over as the technological field see new inventions every now and then, we have set a separate research and development unit to keep ourselves informed with latest developments. Our R&D personnel are highly qualified and monitors and evaluate the market scenario regularly. They also gather the views and requirements of our clients and incorporate them to improvise our products to outshine all expectations of them. They also direct and instruct our personnel in order to make optimum utilization of our resources and minimize the wastage. This results in cutting our cost and further providing our clients with most qualitative, efficient and cost-effective product range.